Vice President Mike Pence walked out of a football game on Sunday (Oct. 8) once he bore witness to players from the San Francisco 49ers taking a knee during the national anthem, a movement that has gained momentum since Colin Kaepernick first spoke out against the oppression of people of color last year. Following Pence's highly publicized departure, the White House issued a statement to further echo President Trump's opposition to the ongoing peaceful protest. The decision to kneel during the national anthem originally was made as a statement against racial inequality, injustice and oppression, with Trump using the controversy behind the movement to further his own agenda. "I left today's Colts game because President Trump and I will not dignify any event that disrespects our soldiers, our Flag, or our National Anthem," the statement reads. "At a time when so many Americans are inspiring our nation with their courage, resolve, and resilience, now, more than ever, we should rally around our Flag and everything that unites us. While everyone is entitled to their own opinions, I don't think it's too much to ask NFL players to respect the Flag and our National Anthem. I stand with President Trump, I stand with our soldiers, and I will always stand for our Flag and our National Anthem." Naturally, the president promptly took to Twitter to discuss the situation, noting that he is "proud" of the VP and the second lady for leaving the premises in response to the silent protests. As people have been pointing out on Twitter, the move to fly into town using taxpayer dollars just to leave and make a statement about the ongoing (and pre-planned) NFL protests feels like a publicity stunt, with others adding that the VP leaving the game further proves that Kaepernick's movement is the most successful non-violent silent protest in contemporary history. Earlier in the day, it was inaccurately reported that Kaepernick said he would stand for the national anthem again if it meant being able to play in the NFL again. He has since addressed the allegation, doing so with grace by way of quoting Winston Churchill. "A lie gets halfway around the world before the truth has a chance to get its pants on. Winston S. Churchill," Kaepernick tweeted in response. As reported, at least fifteen players from the 49ers chose to kneel earlier today. Alternatively, the Miami Dolphins forced their players to stand for the anthem today, with players Michael Thomas, Julius Thomas and Kenny Stills staying behind in the tunnel. Take a look at some reactions to the vice president's actions below. Mike Pence wasted taxpayer dollars just for a political stunt that furthers a culture war premised in white supremacy. Nazis gathered last night, Mike Pence threw a temper tantrum today, and we have Columbus Day on Monday. Great weekend for racism y'all! "Mike Pence" Not offended by Nazis and white supremacists with torches. Just black athletes in peaceful protest taking a knee. 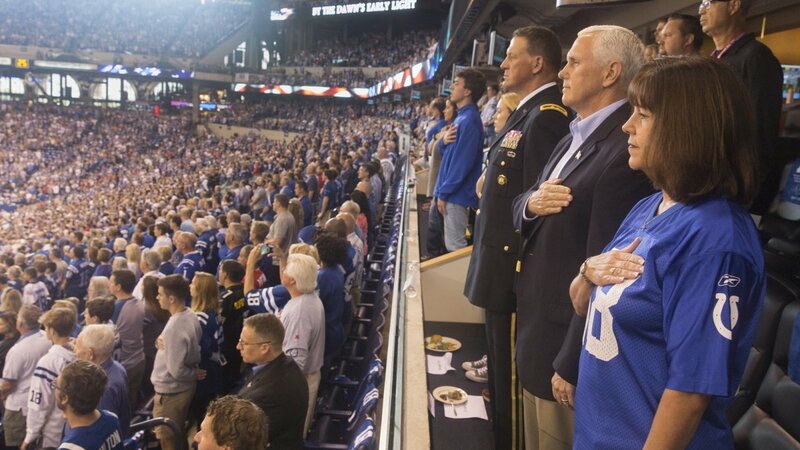 Pence knew players would kneel, yet went to the NFL game. A stunt to play to Trump's base so they'll welcome him when Trump's ousted. Today Pence showed that not only does taking a knee draw more attention to the killing of innocent Americans, but racists leave the stadium. 1. This is fake outrage. Sorry, but this was political grandstanding. Roughly half the Niners knelt last week. How did Pence not anticipate this? Where are his adance people? This was political theater. In my humble opinion.